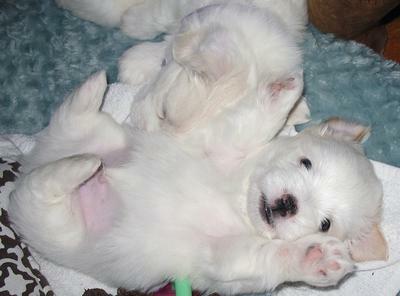 Dear Coton loves, we are so happy to share with you new pictures of our puppies. They were born this Spring. My dogs Gio & Natasha, whose pictures were posted on this website almost 6 years ago along with my personal stories about them, had the most amazing puppies. Along the way we've learned perfect way of grooming our Cotons at home, so they never have mats anymore & found out which dry food is working like a charm for them, so we have no reason to run to the Vet to treat any allergies or seasonal problems that many little dogs have. Always happy to share it with you, dear Coton loves, if you are interested. Have a Blessed & Happy Week. Would U have any puppys left for sale ? And if so, how much ? Im in Burke Virginia, 20 minutes from Washington DC. I'm a 67yr female retiree and live alone . Lana, thanks for sharing your diet and grooming tips. As always, your advice is very much appreciated. I'm so glad you found good homes for the puppies, but I understand how difficult it must be to say goodbye. Our BOY has very full, white, very attractive, but more difficult coat to take care of. When his coat is wet - it looks slightly wavy. Must be thoroughly rinsed after each product you use. Sorry for the delay, but my day is pretty hectic due to taking care of puppies ...they are leaving us one by one,very stressful time for all of us, we got so attached to them, no words ...impossible to say good buy to any of them !!! ZiwiPeak Daily-Dog Cuisine Lamb Canned Dog - many different choices are available, my dogs love lamb. I add only 1 tbl spoon to 1-2 full scoops of dry food - mix it well - it helps digestion & they totally love it. Fido Pet Belly Bone Yogurt Dog Bones are a good source of prebiotics and probiotics, for healthy digestion. The unique V-groove design is easy to hold and massages gums & teeth. 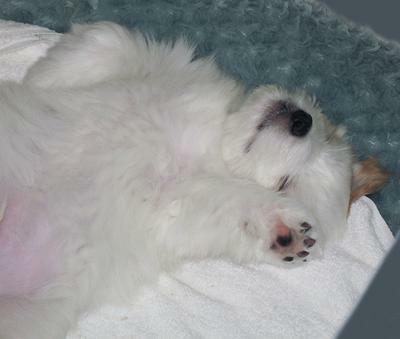 Belly Bone Yogurt Dog Bones contain natural ingredients like antioxidants, omega fatty acids and essential amino acids. They help to support a healthy immune system and enzyme production. See how their stomach will react after the first treat...if not problem you can give it every day. SmartBones SmartSticks Peanut Butter Chews Dog - ( not for puppies !) my adult dogs love these treat more then anything, but can't give them every day. Fresh baby-carrots they eat every day !!! Vitamins & minerals can be recommended by your Vet. Also I learned that my dogs need more minerals & natural vitamins to keep their coat silky & smooth - freshly cooked chicken liver- works better for us mixed with dry food. What is the name of the dog food you use and how do keep their beautiful hair from matting? Such cuties! I'd have 10 Cotons if I could. We just love our sweet 5 yr. old Charlie. Life would be dull without him. He is our 4 legged child, and is treated that way. Please do share all of the information about food and how you avoid mats. Thanks for sharing your pics and info. We can never learn enough about these great little dogs. What happy Coton and so beautiful. I'm sure that's a smile for the camera. Congratulations on your puppies. I would also like to know what dry food you have found for your dogs. Please let me know at t_bognanno@yahoo.com Thank you. Enjoy your Coton's. Ur Coton family is simply adorable. It's always so nice to read when people learn the up keep of grooming w/their Cotons. I really believe that we do a better job of making sure weather their nails, ears, pads, mats etc. r taken care of we have less scratching, or allergy problems. Enjoy ur puppies. Hello! Adorable pups! Would you please mind sharing which dry food you've had the best luck with? 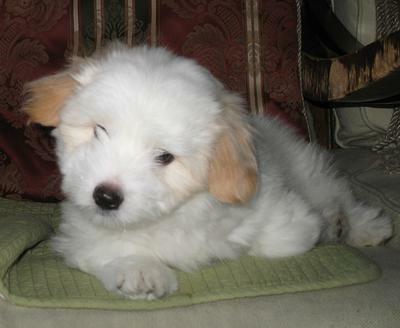 My coton's allergies have been driving him crazy lately. They look like little toys; so cute! Yes please share your grooming and especially feeding tips.